There is a huge variety of poetry included in the English Literature curriculum today. Children can get a lot of fun out of it and it is a fantastic means of improving their reading and writing skills. As parents, we can encourage our children to develop a love of poetry that can benefit them throughout their lives. Poetry for children is becoming increasingly popular, with a new generation of very talented children's poets that compose poems that make children laugh, think and interact with their world. Studies of young people's responses to poetry have shown that narrative poems are the most popular form of poetry; free verse or haiku is the least popular form. Children also prefer humorous poems, animal poems and poetry about familiar experiences that have strong rhythm, rhyme and sound patterns. Even though we can take these guidelines into consideration it is also important to remember that different children will have different tastes and interests so these guidelines are not absolute. As a parent, you may have an idea of what types of poems your child likes and should choose accordingly. Poetry should be an enjoyable part of English Literature and the more your child is exposed to different types of poetry the more they will enjoy it. If your child is very young, rhymes are the most popular form of poetry. More and more, teachers are finding that children are starting school without knowing the classic nursery rhymes that are familiar to all of us. Nursery rhymes actually improve a baby's language skills and play an important role in helping them to learn to read and understand the grammatical structure of language before they go to school and during the initial school years. Clapping and tapping rhythmic patterns can increase a child's awareness of syllables and sounds and can help a child to articulate consonant sounds clearly. As a parent, you should approach poetry with confidence and enthusiasm, and encourage your child to write it eagerly and read it with enjoyment. However, many children, despite enjoying the reading or reciting of poetry have a fear of writing poetry. A starting point for helping your child to write a poem is allowing them to focus on their own experiences and helping them to develop the language to describe them through talk and discussion. 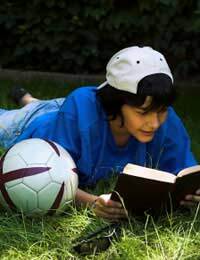 Providing your child with a rich and varied background of poetry by reading it to them and with them will also help to stimulate their poetry writing skills. Your child needs to know that adult standards will not be imposed on their poetry and that it is just a way of responding to something real in their own lives. Help your child feel the rhythm in poems you enjoy reading, and enjoy the fun of writing poems together on topics that your child feels comfortable writing about. If your child has difficulty creating their own rhythm when writing a poem encourage them to choose a poem that they like, borrow the verse and rhythm structure, and then compose new words to fit that poem’s structure. If you are lacking in poetry resources for your child just pay a visit to your local bookstore, library, or visit some of the wealth of children's poetry websites available on the internet. No matter what your child's age they are sure to find something that interests them.